While visiting my favorite shoe stores and websites, I noticed that a lot of them have one thing in common: a thick, heavy chain on the front or on the back. I thought it would be fun to put some of my favorites in one collage. 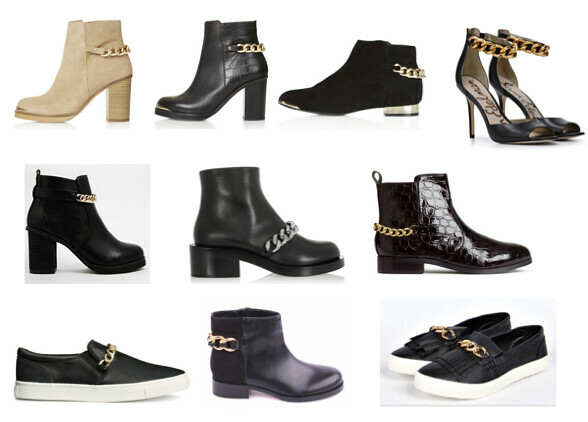 Last week, I had the chance to pick out a pair of Sam Edelman shoes and I went for the black booties in the middle in the bottom row: suède, leather and a gold chain on the back. I'm totally in love with them and I can't wait for them to arrive! Seeing a pair of shoes that you like? Shop them by clicking on the links above or on the pictures below. Ik vind de Sam Edelman schoenen rechts boven vooral bijzonder leuk! those are sooo gorgeous! your post is so excited for me, because i am a shoes lover! some of these models are too much for me, but when the chair is well located I love it! I adore this style of shoes! Dit is helemaal mijn ding! Great article, I love chained boots! Die enkellaarsjes op de 2e rij zijn super!! Oeeeeh, ik vind die enkellaarsjes van Topshop heel erg mooi. Maar eerst ga ik me toch Hanger-booties van Jeffrey Campbell aanschaffen. Ik ben verliefd! Allemaal heel erg leuke schoenen! De laarsjes zijn zo leuk allemaal! I totally get this obsession. I love chained shoes! Super! 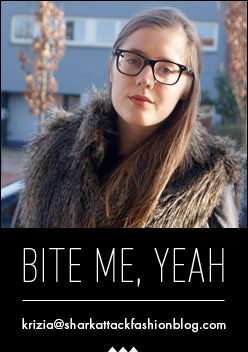 De boots van Topshop zijn mijn favoriet! I'm loving the chain details too! I don't have anything like it yet. Hmm. It's so tempting to buy..